So my art piece today is a study in white space. I am not very good at leaving white space, and today I have a simple page. The background was made when I wiped off a stencil, and then I painted the sun and stamped both the crow and the quote. The crow's branch was a little short but it was an easy fix with a black Sharpie. I am linking up to the New Year:New Adventure theme over at Art Journal Journey. Thanks to all of you who have joined the fun, and if you haven't had any adventures yet, maybe it will soon be time for you join us? We'd love to have you! I love this white space - snow inspired sun adventure bird page! Fabulous! Have fun visiting your mom - make a photo for me! Thank you for your wonderful hosting of the AJJ month - I loved what you wish we can to with our days and time... a perfect solution!!! You should patent this idea! GREAT! This is a wonderful quote and I really love your interpretation. I heard on the radio (and I'm sure I wasn't still asleep) that it might be 42 next week? I don't believe them but a girl can hope! It's gray here today, so your bird singing in the winter sunshine is just the bright spot I need :) Thx! This page is absolutely adorable Erika !! I love so much the winter days, they are very special, enjoying with the family, friends, hot drinks... love the little crow. Great !! It's amazing what a degree or two above zero, and no wild winds to drive the wind chill temps so low you can't see the red in the bottom of a thermometer, can do. Hope you have a nice visit with your mom. Its a fabulous page, I could do with a share of the winter sun, which looks great against the white background. It is a lovely quote. I hope you had a good visit with your mother and got supplies to her. Guess that means school will be in effect tomorrow. I think you did a great thing with white space. I have trouble with that, too. I'm trying to learn, but it's aways hard. Your journal page made me feel a bit warmer, or was that my heater (grin)? Thanks for sharing this warm and welcoming art with us at Art Journal Journey, dear Erika. You are a creating machine, dear! Our cold spell was last half of December. The snow been melting now. When I was younger snow and cold didn't bother me as much. 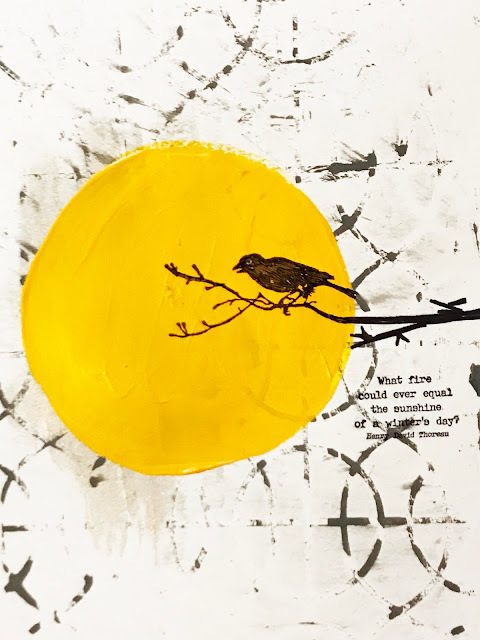 This is a beautiful page with this warm yellow sun - and the bird tells us a very clever quote!